Foot drop exercises are the best treatment for foot drop. Hands down, bar none. Even if you can’t move your foot due to severe paralysis, foot drop exercise can still help. We’ll start by explaining how exercise helps reverse foot drop, then dive straight into the physical therapy exercises. How Does Physical Therapy Help Foot Drop? Foot drop (also called drop foot) is a condition that impairs your ability to lift the front part of your foot up toward your shin. This movement is known as dorsiflextion, and it’s important for walking properly and maintaining balance. 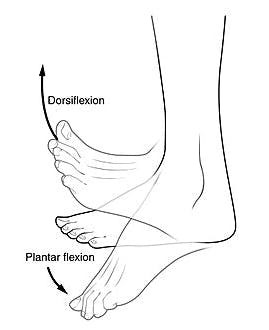 When physical injury or neurological injury (like stroke) impairs dorsiflexion, it can lead to foot drop. Foot drop exercises help reverse the condition by retraining the brain to control dorsiflexion. Now that you know why exercises for foot drop are important, lets get started! Our favorite physical therapists on the internet are Bob and Brad. Not only are they comical and engaging to watch, but their videos are very informative. The second-best video we found for foot drop exercises was also from Bob and Brad. This is another video from Bob and Brad that’s excellent for people with severe foot drop. If you have good pre-existing movement in your foot, then try these strengthening exercises from YouTube. But if you cannot move your foot at all yet, skip this video for now, and come back to it once your mobility has improved. Resistance bands provide a great, cheap way to improve foot drop. Try these foot drop exercises if you’re ready for some advanced moves. We asked Liliana, a physical therapist, for some of her best foot drop exercises. Liliana has experience treating stroke patients, so these may be particularly useful during stroke rehabilitation. The first three are passive, which means they’re great for individuals with low mobility. The last two are active, which offer more challenge. This passive foot drop exercise is a great starting point. With your affected leg still crossed over your other leg, move into ankle dorsiflexion. Use your unaffected hand to move your foot up towards your knee, then back down. Again, focus on imitating all movement from your ankle. For this passive exercise, cross your affected leg over your other leg at the knee. Then, use your nonaffected hand to move your foot up and down (passive exercise). Focus on initiating all the movement from your ankle. For extra challenge, perform without assistance (active exercise). Toe raises are the most difficult movement to perform with foot drop. If you have difficulty with this movement – that’s okay! This passive foot drop exercise you can start reintroducing movement into that area. To get into the starting position, place your unaffected food underneath your affected foot. Then, use your nonaffected foot to assist your affected foot up while keeping your heel on the ground. Then release back down. Once you regain the ability to perform these without assistance, do active exercise for added challenge. This active foot drop exercise is the opposite of toe raises. Although this may not feel like it’s helping with your foot drop, it will help train the surrounding muscles. To perform heel raises, start with your feet flat on the ground. Then, point your toes and lift your heels off the ground. Repeat 10 times. For this active exercise, place your affected foot flat on the ground. Then, lift the outside edge of your foot and toes up, then relax back down. Really focus on initiating the movement from your foot and ankle and avoid making the movement with your leg. To get the most benefit, be sure to emphasize repetition during your foot drop exercises. Repetition helps activate neuroplasticity, your brain’s built-in mechanism for building new neural pathways. Each time you repeat your foot drop exercises, you strengthen new connections in your brain responsible for that movement. If you want to improve foot drop faster, you can use a home exercise program like FitMi to exercise your lower extremities and rewire your brain. When you practice more reps, you achieve more recovery. Your brain will never stop trying to recover as long as you don’t stop putting in the work.